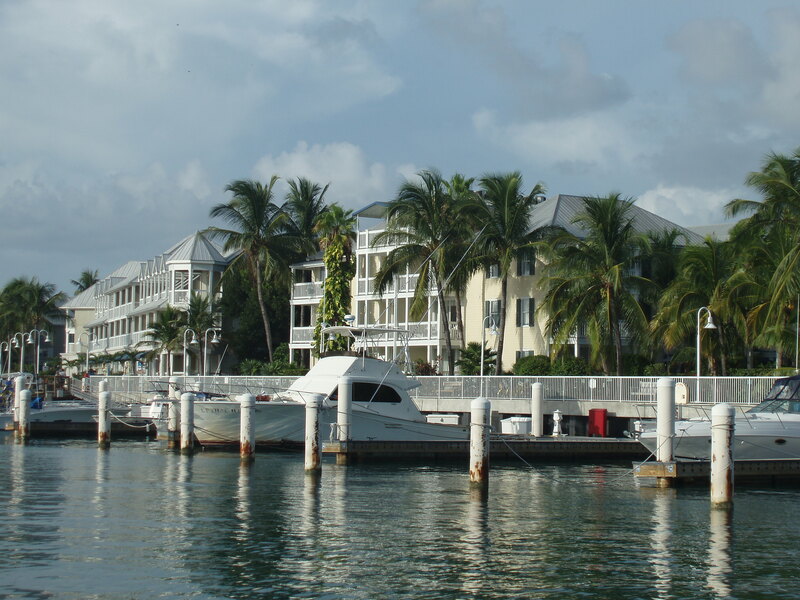 You’ve booked your flight and rooms and are on your way to Key West with your sweetheart. Now for those little details, like choosing just the right restaurant for romance-filled evenings. With dining options galore in the Conch Republic, confusion may ensue. Relax. Let Margarita Moments narrow the choices for you. Michaels – Known for its steak and seafood, this restaurant is a sure bet when it comes to quality cuisine and impeccable service. You may want to dine outdoors in their garden oasis. Michaels’ drink selection is impressive, including a variety of wines and martinis. I suggest the White Chocolate Martini made with Stoli Vanil Vodka & White Creme de Cacao, served in a Belgian chocolate rimmed glass. If you’re interested in one of their delicious fondue appetizers, be sure to order your selection immediately, as it takes 20-25 minutes to prepare. Entree servings are a healthy size, but leave room for dessert. I’d recommend sharing a warm chocolate volcano. Mmm. The Flaming Buoy – A twilight dinner for two on this up-and-coming restaurant’s cozy side porch may set the mood for romance. The waitstaff is friendly yet unobtrusive. You won’t feel rushed as you may at some eateries, and the food is all about taste and comfort. I highly recommend the lobster mac and cheese. Click on the restaurant name above for my unabridged review. Latitudes – This restaurant isn’t in Old Town like the others listed here, but is easily accessible via a complimentary ten-minute ferry ride to Sunset Key. I haven’t eaten here yet. There are so many wonderful choices in Key West, and this Westin Resort restaurant is a bit on the pricey side. Many reviewers say eating alfresco on Latitude’s quiet beach at sunset is worth every penny, though, and I imagine it is. Hot Tin Roof – This restaurant is part of the sophisticated Ocean Key Resort overlooking Key West Harbor, the perfect backdrop for a romantic dinner. You may select small plates or opt for a heartier entree. Click here to see the menu. We’ve never been disappointed with its service or ambiance. nine one five – Located at, you guessed it, 915 Duval Street, this is a tapis restaurant. Request a table for two on the building’s front porch, and you’ll be able to people watch while whispering sweet nothings to your love between servings. If you like chocolate, you may wish to make Life by Chocolate your meal’s final act. Cafe Sole – Boasting French cuisine and intimate indoor or alfresco seating, this award-winning establishment is recommended by Key West aficionados and foodies across the internet. I haven’t eaten here before, but now it’s on my list! Cafe Marquesa – This historied restaurant is affiliated with Marquesa Hotel, lodging designed for the discerning traveler. We’ve biked and strolled past it many times, and look forward to one day sitting inside as patrons. We hear the food is as incredible as the hotel’s reputation. Charter boat — For the ultimate in intimate, rent a private yacht for a dinner sunset sail around Key West harbor. What a beautiful ending to a romantic getaway! Wherever you decide to dine, may you eat and drink in good health and happiness. Bon appetit! What’s the most romantic restaurant you’ve enjoyed or wish to experience? Hi Rebecca! Congrats on your upcoming getaway. I’m happy to help with your planning. BTW, some of the restaurants featured in this post strongly recommend or require reservations. Are you planning to fish? May is the second best month to fish in the Keys–April being first. We’re staying somewhere with a kitchen, so fishing is definitely on the menu! 🙂 And Danger Charter’s day-long snorkeling/kayaking excursion (I’m so excited for this – we did it twice on our last trip). I’d love to hear about your adventures, Rebecca. Definitely pop by and share with us. My husband and I adore Danger Charter’s Wind and Wine Sunset sail. They’re a well-run company. Maybe we’ll take their kayaking/snorkel excursion this summer and switch it up a bit. Last but not least, good luck fishing!! There was a place I took my husband to for his birthday one year called Alias, Smith and Jones in Nassau County and the ambiance was so intimate with a decadent cuisine I can still remember. And we’re talking over ten years ago. Haven’t been back since but always talk about going back. I’ve never been to Key west, but your post is making me hungry. You are so full of wonderful information, Jolyse. At least I know who and where to turn to should I get to go to Key West in the future. I just love these posts. Thanks for commenting, and have a wonderfully productive, prolific week! The top two most romantic dinners I ever had were both in Orlando (naturally) near my beloved Disney World. First was IN Disney’s Grand Floridian hotel, in Victoria and Albert’s restaurant. Diners get their own “Victoria” (waitress) and “Albert” (waiter) who dedicate themselves to only your table. Well hubby pulled out all the stops and we experienced the Chef’s Table inside the kitchen – an intimate alcove overlooking all the chef and sous chef action. Food off the charts and spoiling level high alert! The other meal was at Emerils Orlando – again in his chef’s table. We were pampered and left alone to gaze into one anothers eyes. Highly recommend both as a once-in-a-lifetime experience. Wow, Jenna! You shared two once-in-a-lifetime meals with your husband at Disney, and boy, am I green with envy. Thanks so much for sharing the details with us. Very romantic and memorable. I never knew there were VIP packages like that, but then, I’m not surprised. Disney knows how to do it up right. *eating a lucky dog and drinking a black and tan while sitting on the sidewalk in front of the St. Louis Cathedral in New Orleans French Quarter. * eating at a bar off the beaten path in Cancún and letting the bartender practice his English on me. * eating at King Burger in Rocksprings, Texas where the had excellent Mexican food and treated us like family from the minute we walked in. I like finding places where I feel like I got there by some sort of serendipity. But I love your Key West posts. One of these days, I’m going. Hi Catie! I love your romantic dining experiences. Who you’re with makes all the difference, not necessarily the extravagance of the place. Did you ever see the movie Fools Rush In, starring Selma Hayak and Matthew Perry? There’s a scene where the couple is having a picnic at the Grand Canyon, eating the guy’s favorite hot dogs she had shipped in from NYC for his birthday. How cool is that? Simple, yet very loving because she knew how much he missed that part of his hometown. There’s an Italian restaurant around the corner from our home where we go on our occasional night out (without the kids). The food is great, but the service and our comfort/familiarity with the waitstaff is why we’re loyal patrons. I did like the wine list though. Both wines that we had were very good! Hi Rebecca. Welcome back from our favorite place. I can’t wait for our getaway in July. I’m sad to learn you had a disappointing dining experience at Cafe Marquesa, especially after I’d heard so many stellar reviews. Thank goodness the wine was great! I hope the rest of your trip was incredible. Did you have time for fishing? Any activities or places you’d recommend we check out next?